Freshly made and delicious cocktails to end the day in a relaxing way. Guanacaste Costa Rica All-Inclusive Special! 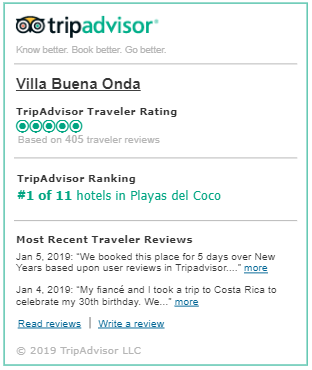 Relax and enjoy your stay at Villa Buena Onda, all details covered. Our popular Meal-Inclusive stay includes 3 daily meals and non-alcoholic beverages, however, if you are looking to have alcoholic drinks included, we will make it happen by adding only $50 per person per night to our Meal-Inclusive Rates. Just choose your favorite room! Our rates are per person, per night based on double occupancy. Check out our resort specials too! PLEASE NOTE: We are an adults-only boutique hotel. Our guest minimum age is 16. Have you already reserved a meal-inclusive stay with us? You have the option to make it all-inclusive for an extra fee. Make your meal-inclusive stay an all-inclusive vacation! *Please add 13% Costa Rican Sales Tax and 2% Service Tax. Based on double occupancy. Rates are per person, per night based on double occupancy. Please add 13% Costa Rican Sales Tax and 2% Service Tax. Travel dates: Now – December 20th, 2019. Check-in time is at 2:00 PM. Check-out time at 11:00 AM. Extra beds are available upon request and they are subject to availability. Beverages purchased outside the villa are not permitted. The first-night stay MUST BE PAID IN ADVANCE in order to confirm the reservation. The balance must be paid 30 days before your arrival. If your reservation is made 30 days prior arrival 100% must be submitted at the time of booking. Please note that by submitting your credit card information you agree to our reservation and cancellation policies. A reservation or modification is NOT CONFIRMED until you have received an e-mail confirmation from our reservation’s office. All reservations, modifications or cancellations must be made in writing and sent via email to reservations@villabuenaonda.com. Cancellations with more than 45 or more days notice will receive full deposit refund minus processing fees. Less than 45 days, no refund. All cancellations need to be sent via e-mail. A cancellation is NOT CONFIRMED until you have received an e-mail from our reservation’s office.